"Go west, young man." Thank goodness some young men did go west to capitalize on all the fertile farmland here. That phrase has now morphed into my new mantra, "Go north, fellow winos." If you drive north of Los Angeles, you'll eventually hit some world renown vineyards. The further you drive, the better the wine. For me, the Napa Valley area still reigns supreme with the quality, quantity and diversity, not to mention the pending truffles. South of Napa and about 5 hours from LA is Paso Robles which holds a special place in my heart for their less than commercial atmosphere with solid wines and farmer, friendly vibe. I fear the day they turn into the more big business focused Napa. Then there's Santa Barbara area, which is a short 2 hour drive from LA, and also an easy train ride on the Pacific Surfliner from downtown LA. The return trains to LA don't run very late so we decided to drive and do an overnight. 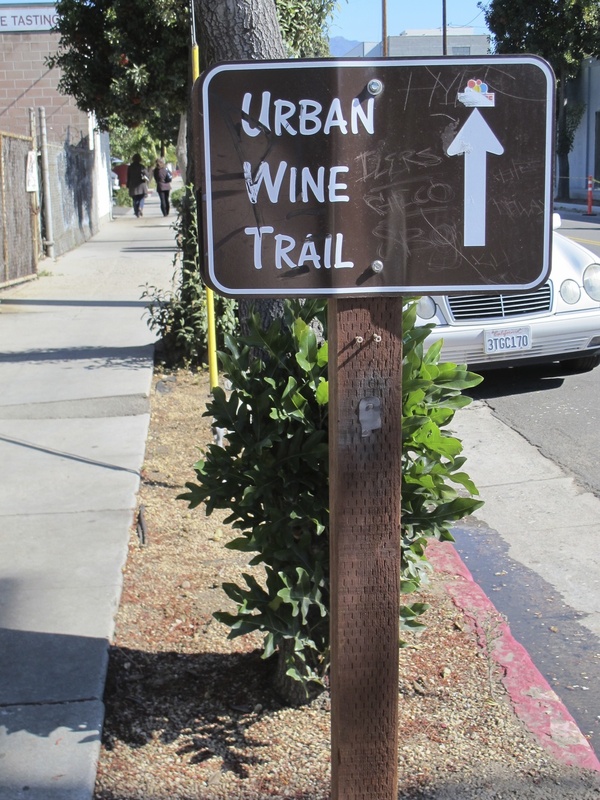 There are many vineyards to explore in the area from Lompoc to Santa Maria, Santa Ynez and Buellton, but we thought the safest thing for our wine loving group to do was to ditch the car and go where only our feet would take us, and that meant we'd be walking the Urban Wine Trail. This trail may not seem like an Everest type hike at first, but when you start at 10am as the first tasting room is opening their doors, by 5pm, you may in fact need oxygen. My team of dedicated trekkers were the first ones to walk in the doors of Santa Barbara Winery. It seemed like the most appropriate place to start as they are the oldest winery in the county, founded in 1962. They have a range of wines from Riesling to Chardonnay to Grenache and Primitivo. They also have a nice spread of olive oils that you can try, along with a shop full of good gifts to take home for fellow foodies and wine lovers. 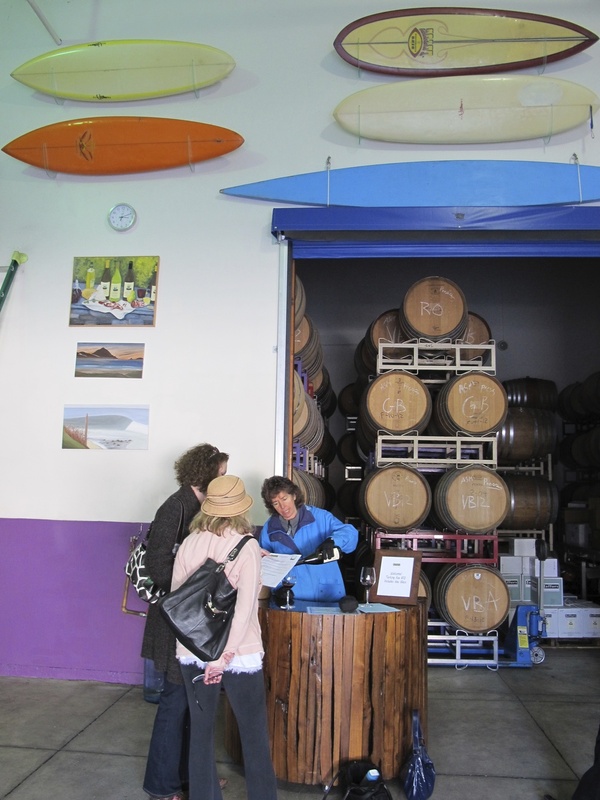 We then made a short hop across the street to open up Pali Wine Company. 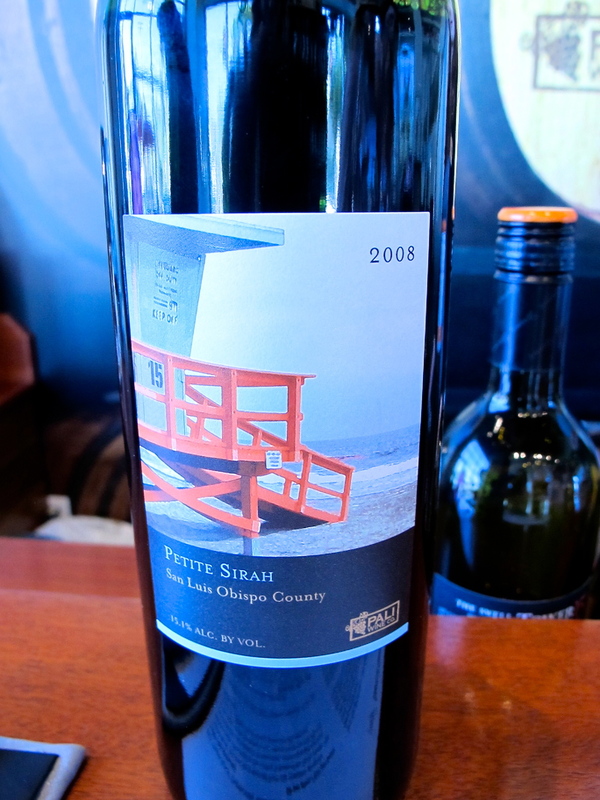 The founders are from the Pacific Palisades in the LA area, and hence the name Pali for the wine, and why they have a Tower 15 line, named after a nearby lifeguard stand. Pinot Noir is their passion, but they do make a few other whites and reds. About 3 steps from here was Anacapa Vitners. They are the newest tasting room in Santa Barbara, and one with the best chalkboard wall maps I've ever seen. If nothing else, come here to figure out where you are and why some people are making specific wine in certain areas. And then wonder why you've never thought of drawing on your living room wall. Next stop was lunch. Time to refuel before taking on the afternoon. A great spot just down the street is Metropulos. The sign outside said to eat more Gyros, so that we did, but you can order lots of other custom sandwiches and salads. We went slightly off trail for the next stop to an appointment only vintner, Sanguis. Sanguis is unique in that they are making their own wine pretty much in a converted house in Santa Barbara. We were able to tour the facilities, see the amazing art that inspired some of the labels, and then we sat down at a big picnic table to sample their wine and eat some fresh bread. The wines were a notch above, and the prices reflect it from $60 - $75 per bottle. We rejoined the mainstream and hit Milpas St. for a tasting in the garage of Jaffurs Wine Cellars. Jaffurs specializes in Rhone varietals, and does a good job with the blends. Nice folks, good wine. Around the corner was our last appointment of the day at Silver Wines. It felt like we were in the basement of someone's house with the low, exposed raftered ceiling. They had a mix of Chardonnay, Viognier and a very nice Syrah for $40. 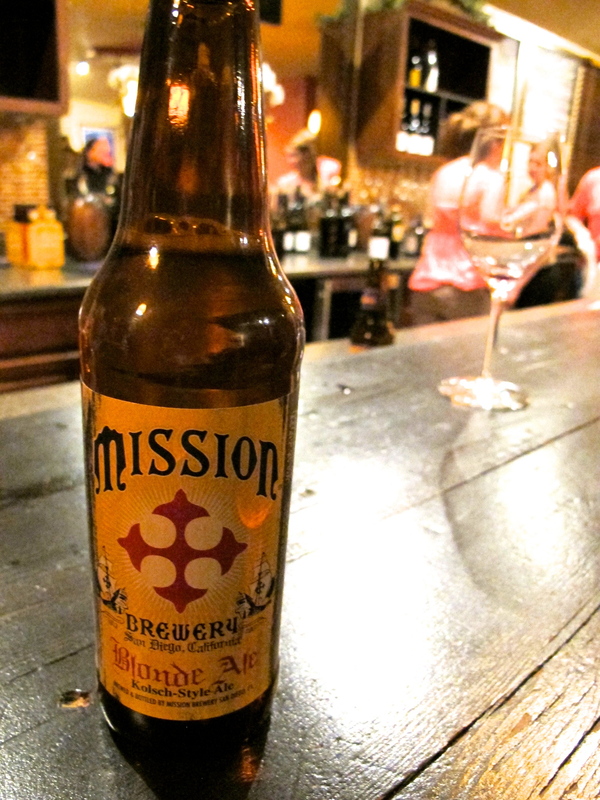 We headed back to "town" for a final tasting at Kunin. They've been around since 1998 and have a good range of Rhone blends and some very smooth Syrahs. Seeing as there was still light in the sky, our mighty trekkers weren't quite ready to call it quits so we ended our tasting next door at the lively bar of Municipal Winemakers. At this point, we were all ready for a beer...and a nap. The final drink of our wine tasting.